Remembered chiefly for having built the steamboat Clermont, which in 1807 successfully made the trip up the Hudson River against winds and strong currents, the versatile Robert Fulton was also accomplished in other fields. It is not usually known that the great inventor was primarily an artist and that his miniature portraits are reputed to be among the finest produced in this country. The Fulton family moved to the city of Lancaster about 1772. For nearly two centuries after the Fultons moved back to Lancaster, the house was owned and occupied by several generations of the Swift family. 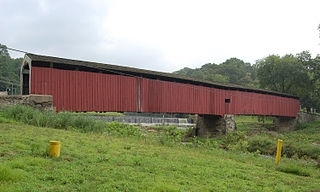 Here during the last half of the 19th century, a small commercial hamlet grew up along the line of the Peach Bottom Railway, later the Lancaster, Oxford and Southern Railroad, which ran through the Swift farm. Known as "Fulton House", this tiny cluster of buildings consisted of tobacco and grain warehouses, a store and post office, all operated by members of the Swift family. In 1965 the Commonwealth of Pennsylvania acquired the site from the Swift family and the Pennsylvania Historical and Museum Commission (PHMC) restored and furnished the house to represent its appearance during Fulton's lifetime (1765 - 1815). In addition, one area of the house contains exhibits chronicling the life and accomplishments of Robert Fulton. In 1966 the Robert Fulton Birthplace was listed on the National Register of Historic Places (#66000670). 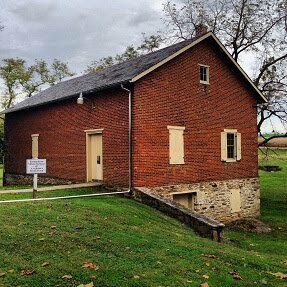 From 1982 to 2017, members of the Southern Lancaster County Historical Society, under a management agreement with the PHMC, had provided routine maintenance of the Birthplace and guided tours for the public. In exchange for these services, the Society maintained its archives, office and meeting place at the warehouse opposite the Fulton House at 1932 Robert Fulton Highway. In February 2017 the Deed to the birthplace property was transferred to the Historical Society, which is now fully responsible for the preservation and upkeep of the five buildings on the property as well as continuing to provide guided tours. The buildings include the Birthplace, the archives warehouse building, a granary, a small barn (previously a tobacco barn, now used as a gift shop and storage building) and a newer outbuilding (restrooms and garden shed). Included in the Deed are several restrictive covenants by the PHMC to ensure the continued care of the Birthplace buildings and property and the continued education of the public as to its historical significance. Robert Fulton was born November 14, 1765 on a farm in Little Britain Township, 20 miles south of Lancaster, Pennsylvania. His father, Robert Fulton Sr., was an Irish immigrant who came to Lancaster in 1735. His mother was named Mary Smith. Robert Sr. was a tailor and small-time trader whose experiment with farming proved a failure. In 1772 the Fulton family farmstead was sold at auction and the family moved back to Lancaster, on Penn Square. According to several biographers of Fulton, his father went back to tailoring and was a respected member of the local community, leaving only a small legacy when he died two years after the family returned to Lancaster. There is no record of how the Fulton family survived the next few years, but young Fulton was tutored at the school of Caleb Johnson, a Tory Quaker. Eighteenth-century Lancaster was a famous center for craftsmen, and Fulton showed an early interest in the workshops which had built many of the wagons that rolled westward across America, as well as much of the weaponry for the American revolutionary forces. Fulton nurtured his early artistic talents by painting tavern and shopkeeper signs, as well as etching and engraving firearms for Isch and Messersmith Gunsmiths. Since Lancaster became a supply center for the Continental Army, American soldiers were a constant presence (as guards for British and Hessian prisoners of war), and this closeness to muskets and cannons laid the foundation for Fulton’s later interest with the weapons of war and instruments of explosion. When he was in his mid-teens, Fulton was apprenticed to Jeremiah Andrews, a Philadelphia jeweler. Fulton was assigned the task of painting lockets and pendants with human hair, often of a deceased relative. It is probable that Fulton worked on miniature paintings that might grace a locket or a brooch, and he gained a reputation as a miniaturist. The first sure record of Fulton can be found in a trade directory of 1785 – “Fulton, Robert, Miniature painter, Corner of 2d and Walnut Streets” – he is described as a miniaturist, apparently working on his own account. It was about this time that he managed to acquire enough money to settle his mother and her brother on a small farm in Hopewell Township, Washington County, and to provide further plots of land for his brothers and sisters. By early 1786, Fulton came up with enough money to treat himself to a health resort (the Berkley Springs) at Bath, Virginia (now West Virginia), as a cure for some ailment of his lungs which resembled tuberculosis. In Bath, Fulton met James Rumsey, who was experimenting with a steam pump to bring water in at the bow of a boat and then drive it through a pipe out the stern, thus propelling the boat. Rumsey conducted his experiments on the Potomac River. However, Fulton was still more interested in painting than steamboats, and the recollections of those who knew him make it clear that his one overall ambition was to become wealthy. Following his treatment at Berkley Springs, Fulton returned to Philadelphia and opened his own miniature-painting and hair-working shop on the west side of Front Street, near the Delaware River. According to biographer Cadwallader Colden, a friend and Fulton’s lawyer for a number of years, it was at the Berkeley Springs spa that Fulton was advised by “some gentlemen” to go to England to study painting with more celebrated artists than Philadelphia could offer. Fulton decided in the summer of 1787, during the Constitutional Convention, to sail for Europe to study art. Fulton left for London with a letter of introduction to the American painter Benjamin West, who had established himself as a founding member of London’s Royal Academy of Arts. Family tradition says the letter of introduction was written by Benjamin Franklin, who would have known West from his earlier travels in England. West helped Fulton find lodgings in London and took him on as a student. Unfortunately, not one of Fulton’s paintings from this period survives. Fulton’s first foray into the world of inventions was the design for a marble-cutting machine, a model of which won him a medal by the Royal Society for the Encouragement of Arts, Manufacturers and Commerce. His London friendships with the Duke of Bridgewater, who built his own canal, and the Earl of Stanhope, a great experimenter, inspired Fulton to abandon art for civil engineering, between 1792 and 1794. Sometime around 1794, Fulton sought his fortune planning a small system of canals to transport goods inland, and designing machines for cutting marble and spinning flax with a powered loom. Fulton also fostered his interest in steam propulsion with a boat in a correspondence with Lord Stanhope. At the right is a self-portrait of Robert Fulton. In the spring of 1787, during a lull in the hostilities between England and France, Fulton journeyed to Paris to seek his fortune with his canal schemes. Fulton became close friends with the American poet and businessman Joel Barlow and his wife Ruth. These Paris years—coinciding with Napoleon’s emergence as a great military leader—were extremely influential on Fulton’s future career. His career focus shifted from painting and canal design to the steamboat and steam navigation. Fulton designed a submarine, the Nautilus, which he tried to sell to Napoleon. The submarine’s appearance was based on David Bushnell’s failed American Turtle submarine used during the American Revolution. Fulton’s Nautilus was a cigar-shaped vessel, just large enough for two men who could submerge for up to six hours. Fulton’s submarine was powered by a hand-cranked propeller and could submerge, which was a great advance on Bushnell’s model. Two underwater trials failed, and the French government was not convinced by Fulton’s submarine design. Nevertheless, Fulton firmly believed that his devices would put an end to naval warfare. As for the development of the steamboat, for which Fulton ultimately became famous, there were literally dozens of precedents for the boats he had built in Paris and tested on the Seine River. Fulton achieved his future success with steamboats by becoming acquainted with British, French and American promoters of industrialism. By 1801, Fulton had befriended the American minister to France, Robert R. Livingston from New York State. Livingston was also interested in steamboats and laid much of the groundwork from the Boulton and Watt steam engine company to study the feasibility of making a steam engine which might be used to power a boat. Fulton, with the backing of both Livingston and Barlow, succeeded in bringing a Boulton and Watt engine to New York in December 1806 and began constructing the hull for his pioneer steamboat trials on the Hudson River using the Clermont. Robert Fulton commissioned Charles Browne to construct a wooden hull using the components of the Boulton and Watt engine at Corlear’s Hook on the East River in New York City. When finished, the steamboat was towed to Fulton’s workshop at Paulus Hook Ferry on the Hudson River. Livingston continued to enforce and extend the patent monopoly created with Fulton to protect against rivals in the competition for steam. When completed, the steamboat was 150 feet long, but only 13 feet wide, with a square stern. Two paddle wheels hung over the sides. The steamboat’s first trials were made in 1807, running up and down from New York to Livingston’s estate at Clermont on the Hudson. The name of his first boat is a matter of dispute: most sources say it was the Clermont, but others that it was the North River. After the successful first voyage up the Hudson River, Chancellor Livingston predicted that steamboats would one day cross the oceans. Livingston also announced that his niece Harriet was engaged to be married to Robert Fulton. In January 1808, Fulton married Harriet Livingston and became a family man: by the time of his death in 1815, Fulton had four children. He continued to build new boats - 21 in all – and the success of the steamboat very rapidly began to transform America. Fulton’s steamboat became the most important form of transport before the arrival of the railways and a great symbol of American industrial progress and wealth. Fulton’s steamboats were also transformed into military machines, which went against a central ambition of his life. However, there were few places in America that Fulton’s steamboat did not transform commercial processes, social customs, the patterns of migration and growth, and the speed of travel and communication. The technical skills and artistry of Robert Fulton’s steamboat demonstrated a great triumph of human technology over nature. Postcard celebrating the 100 Year Anniversary of Robert Fulton's Steamboat "Clermont"
Cochran, Thomas C. Frontiers of Change: Early Industrialism in America. New York: Oxford University Press. 1981. Colden, Cadwallader. The Life of Robert Fulton. New York: Kirk & Mercein. 1817. Flexner, James Thomas. Steamboats Come True. Boston: Little, Brown, and Co. 1978. Kroll, Steven. Robert Fulton: From Submarine to Steamboat. New York. Holiday House. 1999. Morgan, John S. Robert Fulton. New York: Mason and Charter. 1977. Sale, Kirkpatrick. The Fire of His Genius: Robert Fulton and the American Dream. New York: The Free Press. 2001.